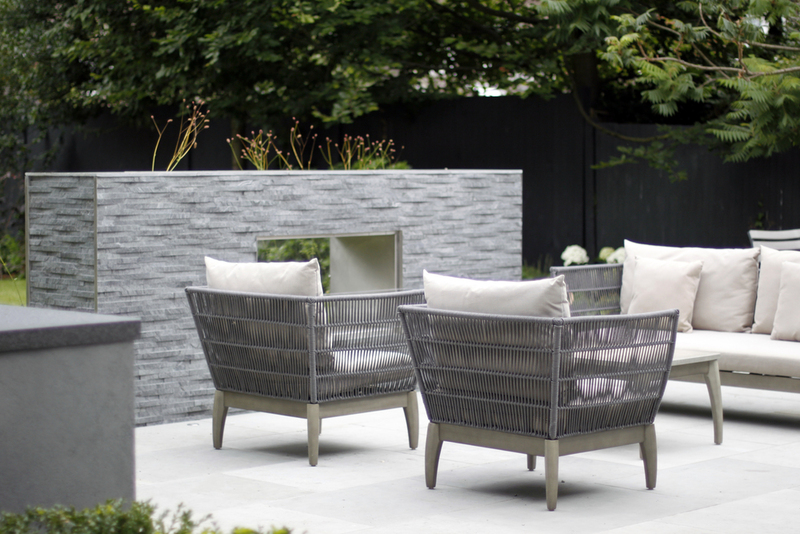 This family garden design in East Sheen, Richmond, was created for a young family looking to combine grown up entertaining space, an exterior studio and areas for the children to play. The design focuses around a large social terrace close to the house with a central stone fireplace. A new barbecue unit was constructed incorporating a built in gas barbecue and plenty of storage. Purple Beech hedges dissect the space and provide screening for a sunken trampoline, golf putting area and the studio gym equipment. The deep purple tones are continued in the planting scheme where purple and soft pink perennials are blended with grasses to create a relaxed contemporary feel. At the far end of the garden a simple bespoke steel pergola incorporates a hanging chair large enough for two to relax in the evening sunshine.